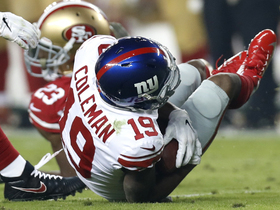 The Giants signed Coleman off their practice squad Thursday, Adam Schefter of ESPN reports. The Giants signed Coleman to their practice squad Thursday, Art Stapleton of The Bergen Record reports. Analysis: Coleman's addition comes after he apparently impressed team brass during a workout Wednesday. 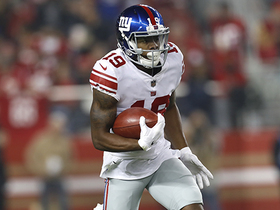 While he won't be included on the Giants' 53-man roster, Coleman could eventually push for a depth role in the New York receiving corps -- if he isn't scooped up by another team -- once he gets acclimated with coach Pat Shurmur's offensive system. Coleman's most recent stint came with New England in September, but he was waived without ever suiting up in a game. Coleman worked out with the Giants on Wednesday, Field Yates of ESPN reports. 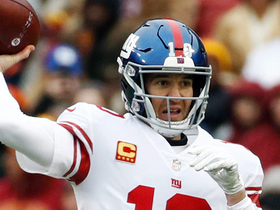 Analysis: Coleman has been evaluated by both occupants of MetLife Stadium this week, as the Giants and Jets have seen their wideout depth gutted by injuries. The 2016 first-round pick is practice-squad eligible, meaning an organization can ink him for a much lower cost and see if he can acclimate to the offensive system. Whether or not he lands on a 53-man roster remains to be seen, but Coleman has yet to log an offensive snap with any team this season. Coleman is scheduled for a workout with the Jets on Tuesday, Field Yates of ESPN reports. Coleman worked out for Tampa Bay on Tuesday, Zac Jackson of The Athletic reports. 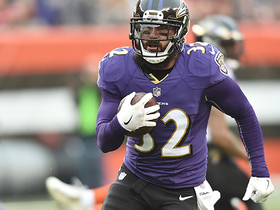 Analysis: Though Coleman was in Tampa Bay for a workout, it isn't clear if a deal was reached, as the former first-round draft pick continues to look for another chance in the NFL after flaming out in Cleveland. Coleman also spent time with the Patriots this season. Coleman was released from the Patriots' practice squad Saturday, Ben Volin of The Boston Globe reports. Analysis: Coleman has now been cut three times in a little over a month, which could make it tough for the 2016 first-round selection to find a new home. However, he does have upside and could find his way onto another team's practice squad in need of wideout depth. Coach Bill Belichick noted that Coleman, who is now a member of the Patriots' practice squad, is a talented player that the team wants to keep working with, Doug Kyed of NESN.com reports. Analysis: Normally we don't get too fired up about practice squad wideouts who have been cut twice in a month, but as the No. 15 pick in the 2016 NFL Draft, Coleman does have some untapped upside. If he practices well, he's a candidate to be promoted to the Patriots' active roster and could conceivably make a splash before the end of the season. Coleman signed with the Patriots' practice squad Thursday, Kevin Duffy of MassLive.com reports. Analysis: Coleman was cut by the Patriots on Monday to make room for Josh Gordon after Gordan was acquired from Cleveland. Coleman went unclaimed on waivers Tuesday, and the No. 15 pick in the 2016 NFL Draft will now work to earn a depth role in New England via his work on the practice squad. Coleman passed through waivers unclaimed Tuesday, Adam Caplan of SiriusXM Radio reports. Analysis: Coleman spent less than a week with the Patriots, after the team decided to use his roster spot to acquire former teammate Josh Gordon. The 2016 first-round pick reportedly worked out for numerous teams prior to signing with New England, so it's likely that Coleman will find a new home in the league before long. Coleman was cut by the Patriots on Monday, Field Yates of ESPN reports. Analysis: Coleman's time with the Patriots is over after less than one week, as New England now needs his roster spot in order to bring in Josh Gordon, who the team acquired in a trade with the Browns on Monday. There are plenty of organizations around the league that could still use Coleman's help at receiver, though, so the 2016 first-rounder may not be out of work for long. Prior to signing with the Patriots, Coleman reportedly worked out for a number of teams, including the Cardinals and Eagles. Coleman is inactive for Sunday's game against the Jaguars. Analysis: Coleman may factor in as the season rolls along, but he's new to the team's offense and needs more time to get up to speed with the Patriots' playbook. Chris Hogan, Phillip Dorsett and Cordarrelle Patterson are slated to head the team's Week 2 wideout corps. Coleman and the Patriots agreed to a one-year contract Tuesday, Ian Rapoport of NFL Network reports. Coleman worked out for the Cardinals on Friday, Field Yates of ESPN reports. Analysis: Traded from Cleveland to Buffalo during training camp, Coleman was unable to crack the 53-man roster on a Bills team with minimal talent at his position. It obviously wasn't a good sign for his NFL future, but the 2016 first-round pick still figures to generate some interest around the league. He's only 24 years old, and his first two professional seasons were marred by injuries. 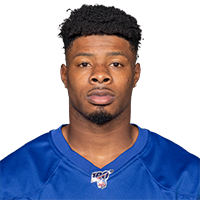 The Bills have cut Coleman, Ian Rapoport of NFL Network reports. 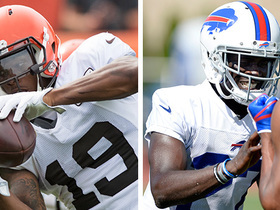 Analysis: The Bills didn't pay much -- a 2020 seventh-round pick -- to acquire Coleman from the Browns at the beginning of August, but the team was so thin at wideout that the thought was he could possibly work his way up to the No. 2 spot in quick fashion. He never got up to speed, however, and a disappointing preseason led to the 2016 first-rounder's release. He'll now be looking for a third NFL chance just three years into the league. Coleman failed to bring in any of his three targets during Thursday's preseason finale against the Bears. Analysis: Coleman wasn't a lock to make the roster entering the night and he did absolutely nothing to bolster his case before the final whistle blew. However, it would admittedly seem premature for the Bills to cut bait with the 2016 first-rounder before Week 1, especially since Buffalo owns one of the weakest receiving corps in the league. On the other side of the coin, the Bills only parted with a 2020 seventh-rounder to acquire him from the Browns. Coleman caught both of his targets for a net of zero yards in Sunday's preseason loss to Cincinnati. Coleman caught his only target for a seven-yard gain in Friday's preseason loss to the Browns. Analysis: Per WKBW's Joe Buscaglia, Zay Jones got the start across from Kelvin Benjamin and finished with one catch for five yards on one target. Coleman's reception didn't come until the third quarter, but he could get some run with the starters if he learns more of the playbook before next Sunday's preseason game against the Bengals. It appears Coleman has ground to make up in the battle for the No. 2 receiver job. Coleman likely will play in Friday's preseason game against the Browns, Chris Brown of the Bills' official site reports. Analysis: Though he figures to get some snaps, Coleman may not know enough of the playbook to warrant extended run. He'll probably enjoy the opportunity to face his former team so soon, but his more important task is competing for the No. 2 receiver job with Zay Jones. Coleman won't play in Thursday's preseason game versus the Panthers. Analysis: Coleman has been a member of the Bills for less than a week after two uninspiring seasons with the Browns. Due to the lack of practice reps, it's no surprise he won't be out there, especially with three more chances to make an impression on the coaching staff before the regular season. Both Coleman and Zay Jones (knee) have been scratched, leaving Kelvin Benjamin and some combination of Jeremy Kerley, Andre Holmes and Rod Streater to get reps with the first-team offense. Coleman (hamstring) took part in the Bills' practice Wednesday after passing his physical, Mike Rodak of ESPN.com reports. The Bills sent the Browns a seventh-round draft pick in 2020 in exchange for Coleman (hamstring), Mike Rodak of ESPN.com reports. 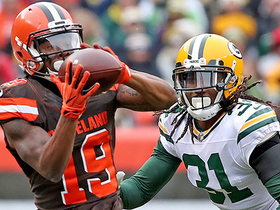 Analysis: That's quite a small return for the first wideout taken (15th overall) in the 2016 NFL Draft, but the Browns decided to move on from Coleman, whose two-season stint with the team was slowed by injuries. Once Coleman passes his physical with the Bills, he'll look to secure a key role in his new team's wideout corps, a unit led by Kelvin Benjamin that doesn't possess much certainly beyond that. Cleveland has agreed to trade Coleman (hamstring) to Buffalo for a draft pick, Adam Schefter of ESPN reports. 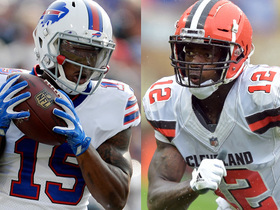 Analysis: Coleman could quickly become a top-two target in Buffalo along with Kelvin Benjamin and his trade could mean the Browns are confident Josh Gordon will return to training camp. Coleman was limited throughout portions of Saturday's practice due to hamstring soreness, but the injury sounds minor and likely shouldn't limit completion of the trade. Coleman was limited throughout portions of Saturday's practice due to hamstring soreness, Mary Kay Cabot of Cleveland.com reports. Analysis: Coleman has a history of hamstring issues, so his limitation in Saturday's practice is a precautionary move as the soreness appears to be extremely minor. The Browns figure to continue proceeding carefully with the health of their No. 3 wide receiver, potentially keeping him limited until the hamstring returns to full strength. Coach Hue Jackson has been "really impressed" with Coleman's performance in training camp so far, Nate Ulrich of the Akron Beacon Journal reports. Coleman will occupy the starting spot across from Jarvis Landry while Josh Gordon (personal) is away from the team during training camp, Nate Ulrich of the Akron Beacon Journal reports. Analysis: Despite entering training camp with a regular spot on the starting offense, Coleman may ultimately end up competing for the No. 3 wideout spot with rookie Antonio Callaway. The 2016 first-round pick has produced just 5.5 yards per target in 19 career games, with injuries and poor quarterback play contributing to his struggles. Coleman may face competition for playing time from fourth-round rookie Antonio Callaway (toe), Mary Kay Cabot of Cleveland.com reports. Coleman, who hauled in one catch on six targets for 18 yards during Sunday's 28-24 loss to Pittsburgh, ends 2018 with 23 receptions for 305 yards and two touchdowns. Coleman brought in one of three targets for 16 yards during Sunday's 27-10 loss to Baltimore. Coleman caught five of six targets for 62 yards and a touchdown in Sunday's 27-21 overtime loss to the Packers. Analysis: Coleman tied for the team target lead with Josh Gordon, who caught three passes for 69 yards and a score of his own. From Coleman's perspective, it was a big improvement from the previous week, when Gordon held an 11-4 edge in targets. Given the lack of complementary options in the receiving corps, Cleveland should be able to keep both wideouts busy throughout December, including in Week 15 against a Ravens team that recently lost top cornerback Jimmy Smith to a torn Achilles. Coleman played 81 percent of the snaps on offense in Sunday's 19-10 loss to the Chargers, failing to catch a pass on four targets. Coleman was unable to haul in any of his four targets during Sunday's 19-10 loss to the Chargers. 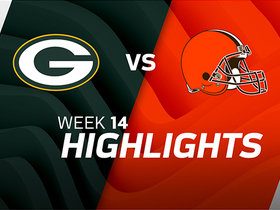 Analysis: Josh Gordon's return was expected to aid Corey Coleman, but that wasn't the case on Sunday versus the Chargers. Gordon saw seven more targets than Coleman, and for the first time in his short career, Coleman finished a game without a reception. This may just be an aberration, but consider Coleman a risky fantasy start until he proves he can be productive alongside Gordon. Coleman grabbed three receptions (on eight targets) for a team-high 64 yards during Sunday's 30-16 loss to the Bengals. In his return to action in Sunday's 19-7 loss to the Jaguars, Coleman (hand) started opposite Ricardo Louis, hauling in six of his team-high 11 targets for 80 yards. Analysis: The Browns didn't get much going in Sunday's loss -- which dropped the team to 0-10 -- but Coleman's developing chemistry with QB DeShone Kizer was a bright spot. Coleman and his teammates will travel to Cincinnati for a Week 12 showdown against the Bengals, who entered this weekend with a 3-6 mark on the heels of two straight losses. Coleman (hand) is listed as active for the Browns on Sunday for the first time since Week 2. 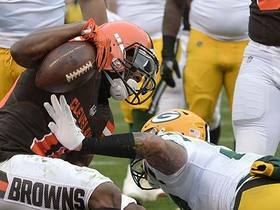 The Browns activated Coleman (hand) from injured reserve Thursday. Browns coach Hue Jackson said Monday that Coleman (hand) will return from injured reserve for Sunday's game against the Jaguars, Nate Ulrich of the Akron Beacon Journal reports. Though Coleman indicated earlier this week that his hand is 100 percent recovered, he has not yet been activated off IR, the Browns' official site reports. Analysis: The report notes that the wideout is eligible to return to game action next week against the Jaguars, assuming no setbacks. While the 2016 first-rounder has some long-term upside, and did show a degree of chemistry with QB DeShone Kizer in Week 1, he'll be a speculative fantasy play until he gets a full and productive game under his belt. Coleman, who resumed practicing Monday, said his fractured right hand has fully healed, Patrick Maks of the Browns' official site reports. The Browns have designated Coleman (hand) for return from injured reserve, Nate Ulrich of the Akron Beacon Journal reports. Analysis: After breaking his right hand Week 2 and landing on IR, Coleman wasn't eligible for activation until Nov. 12 in Detroit, at the earliest, which is now looming on the schedule. Because he's expected to take part in certain parts of Monday's practice, he'd likely be limited if the Browns were required to release an injury report. It's unclear if he's healthy enough to make an appearance this Sunday, but Coleman's availability will be determined by week's end, if so.